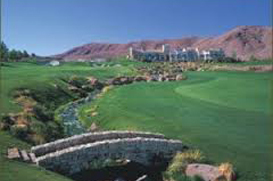 Located in the southwest part of the Las Vegas Valley is Southern Highlands. Masterfully planned in 2000 and just 10 minutes from the Las Vegas Strip and McCarran Airport, you will find a magnificent secluded oasis in the desert. As one of Las Vegas’ finest and fastest-growing communities, it was constructed around the award-winning Robert Trent Jones championship golf course. There are two distinct areas in Southern Highlands, The Villages and The Estates. In the Villages, you will find real estate that is affordably priced boosting single family homes, condominiums and vacation rentals designed with families and singles in mind. There are gated and non-gated properties surrounded by impeccably maintained front yards. The upkeep shown in these homes is a fantastic insight into the areas curb appeal and pride of ownership. Truly a family oriented community, there are over 2,300 acres of beautiful parks, recreational facilities, sports parks, tennis courts, and dog parks, making this area a popular spot for the busy family lifestyle. The community also features a trail system that intertwines throughout the area for jogging, walking, biking or hiking. Southern Highlands offers all of the modern day conveniences of shopping, lakefront dining, a fire station, and both public and private schools in town. The Estates is a prestigious guard gated golf course community with gorgeous custom and semi-custom exceptionally designed homes offering from one-half to one acre lots. Many homes are located on or near the golf course featuring breathtaking views of spectacular green fairways surrounded by rolling hills. The residents here can enjoy the conveniences and services found both within The Estates itself and within the entire Southern Highlands. There are several gated neighborhoods located within the Estates including Castle Oaks, Vintage Valley, Eagle’s Landing and Olympia Hills. The Estates is better known for being home to the world famous Southern Highlands Golf Club and Spa (membership only) which has a 220-acre private one of a kind 72 hole golf course, co-designed by Robert Trent Jones, Sr., and Robert Trent Jones, Jr. Membership at this private club is by invitation only and is limited to 300 guests. The average price range for luxury custom homes in the Estates is above one million dollars. Let our team of top agents help you to find the perfect home in this amazing area.